For the second straight year Novak Djokovic has withdrawn from Spain’s biggest tennis event, the Madrid Masters. The World No. 1, who missed the 2014 event due to a right wrist injury, will return for Rome in about two weeks. No one has been better than the Serb this season. Djokovic has won all three Masters events and took home the Australian Open. With Djokovic out, Roger Federer will be the top seed at the event. Good move on Nole’s part imo. Don’t burnout before RG. i think it’s a good choice too: more time to rest and practice. the conditions are slightly different in madrid than monte carlo, rome or paris, so if he were to pick one to miss, i think this is the right one. i am sure he’ll be practicing. I agree with skeezer. The last year or so looks rather weak to me. Today an almost 34 yr old Roger is the best of the rest. Speaks to his unmatched longevity in terms of relevance. Hardly a strong era when one player is dominating the field with more than 5000 point lead. You guys, Roger’s record point lead was arguably even higher if you account for inflation back in the day. Childish Nole. Very unsportsmanlike and this is the very reason you’ll never have as many fans as Rafa and Roger. Too bad, since your tennis talent and strong will are there. You just can’t handle the fact that people like other players more. You don’t have that pure heart needed to acknowledge that other players do exist and do deserve equal if not bigger admiration. What a farce this has been for the last few days! Will he play? Won’t he play? He always knew he was going to withdraw!!! ROFL!! indeed, murray looks great again, having reached another slam and masters final at the start of this year. he’s veering back to his best. roger, meanwhile, continues to improve his game with edberg and the fruits of that labour were clearly in evidence throughout 2014 when he reached the wimbledon finals beating class players and then the us open semis, not to mention winning davis cup. 2014 was the best roger we had seen since the middle of 2012. then in 2014 we witnessed the break-throughs of stan, who had been pushing throughout 2013 too; nishikori, who reached his first slam final, and of course cilic. really, only rafa has been struggling but he had injuries and an operation. delpo too, but delpo has been on-and-off since he won his slam in 2009. 2014 we also saw the debuts of players like coric, kyrgios, and triple K, who show lots of promise. even dimitrov and ranoic had a pretty good 2014s, reaching the wimbledon semis. so, whatever. tennis looks pretty darn fine to me. Federer contrary to Djoko seems to be playing clay season for confidence. He is almost lock to win Istambul this weekend and has a good shot at Madrid (a title he won on clay twice). 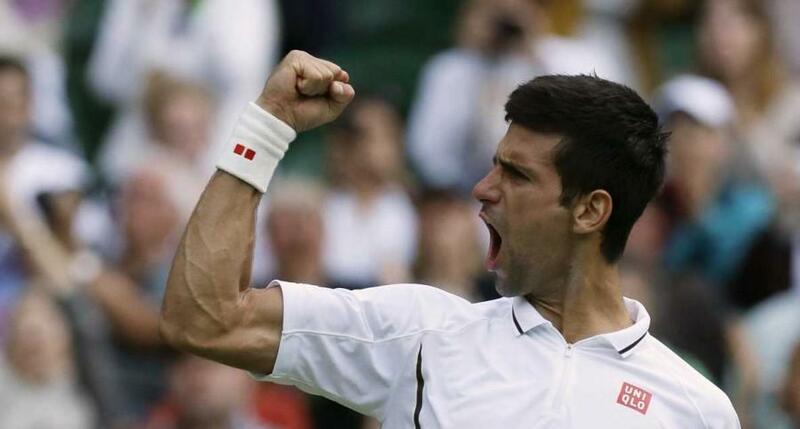 Altitude, faster conditions and being top seed courtesy to Novak. I think if he goes deep in Madrid or even win it he will skip Rome and go to RG with two titles in the bag or 1 title and a deep run, regardless if MC and Rome are the closest to RG conditions. He wants clay confidence and get some momentum. Djoko on the other hand, already have MC with a win over Nadal, if he wins Rome and get another win over Nadal, he will be ready to Checkmate at RG, winning the 2 Masters that resemble the most RG. He had won 2 poor to RG in 2011, Madrid and Rome, but playing only MC and Rome and winning both would be huge for him. Plus he would have prolonged his major titles winning streak going back to Paris. Also, Djoko and Fed have won the last 6 Masters contested, back to Cincy 2014: Cincy (Fed), Shangai (Fed), Paris (Djoko), IW/Miami/MC (Djoko). That a weak era started once their beloved Federer was past his peak. As Jane outlayed, the time is hardly without top level competition. Roger Federer is a true all-time great. Still a force today. And without Rafa, he may indeed have won at RG a few times. But his stats were padded somewhat, the extent is arguable, by that weak era, which also benefited Lleyton Hewitt giving him an unimaginable 75 straight weeks at #1 before Fed began his great run as Big Fish (in a small pond). Fed never beat his nemesis in a Slam after 2007. So in a sense all Fed fans should have gratitude that Djokovic ended FEDAL just at the point Nadal had begun to dominate it. And there is Madrid 2009. The semi between Rafa and Nole was a classic, and the longest 3 set Masters played. Both had several match points. And left both guys hobbled the rest of 2009 (Nole well into 2010 to rebuild himself mentally). Which Fed was a big beneficiary of. I tell ya Sirius, that 3.5 hour match – it’s not like they’ve ever played 5hours+ in an grand slam final – just laid waste to 2 of the most splendid specimens of human athletic achievement. And case in point, Nadal has never had to take time off for injuries besides that one time in 2009. Get more time with family, batteries recharged, both mental and physical, and get ready for Rome. It will be so nice to root for all my faves without stress. And I’m sure I’ve firgotten many others. Remember that he who kills by the sword, dies by the sword… that what is sauce for the goose, is sauce for the gander. I think it is unhealthy for tennis that the Masters Series / Super 9s / whatever they’re called these days are mandatory for the top pros. I think the top guys and gals should have to play 3 or 4 of these things in a calendar year, giving them flexibility on how to prepare their schedules and best manage their health issues. To me, the top players should focus primarily on the Slams, and if a player wants a break from the US Open all the way to the April clay court season, skipping the indoor season, the ATP/WTA Championships, the Aussie Open, Indian Wells and Miami, she or he should be able to do so. The fans care about the Slams. TV cares about the Slams. I assume the championship caliber players mostly care about the Slams. Good for Novak skipping Madrid. I hope they don’t fine him or suspend him from future tournaments. they can’t. he’s played over 600 matches, which allows him to skip one masters without penalty. he’s completely within his right not to play madrid. It does not look good for the Madrid tournament reputation when for two years in a row they do not have the world #1 player participating. Considering it is most likely Novak will be No.1 this time next year, I would not be surprised if Madrid Masters offers to pay Novak a huge appearance fee (‘under the table’, of course). I know, it doesn’t happen usually since masters are “mandatory” and tournaments do not have to offer appearance fees to anyone, but in this particular case, the No.1 is allowed by rules to skip one Masters, and looks like he will make sure the one he skips each year is the Spanish one. On the other hand, it may work as a unique advertising plot – imagine Madrid’s promotional materials in future – we are the only Masters 1000 not to feature the best player! If you get annoyed by seeing the best player beating the rest of the field, this is the place to be – we guarantee the No.1 will not win our tournament!!! While Novak is an amazing player, it is Nadal and Federer who continue to be the main attraction in tennis. Either of these two would be a much bigger loss in terms of tournament revenue. Novak has the right to skip 2 MS1000 this year, since he has fulfilled two required conditions: more than 600 matches (1), 12 years as a pro (2). -give Nole the “slack” to which he is entitled. Djokovic is not 31 yet. So he is not allowed to skip masters. He is taking a zero pointer for Madrid. That will be his punishment. I believe Novak didn’t play the minimum amount of tournaments in 2003 for it to count as a whole season, so he’s only played 11 full seasons as a pro. Next year, though, he’ll fulfill that condition as well and will be able to skip two mandatory masters without penalty. You made me laugh aloud. I confess I thought that Tiriac giving money to Nole’s foundation during the Balkan floods last year was going to be enough incentive for Novak to play this year. nole certainly does deserve some “slack.” he’s missed virtually no time over the years and plays deep into most tournaments he enters as well. he and federer definitely have been two of the more consistent players that way. That’s what I thought too, but I found that on eurosport.fr. I hope they know what they write. that was interesting mat4, thanks. would you recommend that blog in general. Also, Djokovic is the player who least play smaller tournaments. He plays zero 250 in last years (this year only played Doha because AO was postponed 1 week) and only 2 ATP 500, in Dubai and Beijing. He used to play Basel where he won a couple times but not anymore. This year he will add Halle or Queens (only because there is another week between RG and Wimbledon), does anyone know which one he’ll play. IF everything goes accordingly to plan, he will have 1 ATP 250 (Doha), 3 ATP 500 (Dubai, Halle/Queens and Beijing), 8 Masters, 1 WTF and 4 GS = 17 tourneys. Last year he played 15 (less Doha and Halle/Queens). Compared that to Fed and Nadal (who only played less because missed 5 tourneys due to injury / illnes). I will put thi on Nole thread since they are coming from the same contry. Excatly twenty two years ago the brightest star of female tennis was stabbed by crazy fan who wanted his favorite back at the top. He succeeded, Monica seles was never the same player after she returned (after 27 months), she managed to win one more AO at her age of 22 and that was her last slam. Crazy fan didn’t spend one single day in jail. I wish that happened in America instead of Germany, I believe he wouldn’t get out of jail/institution for a long long time. She has never played in Germany again, I believe she hasn’t been there either. Correction, 8GS titles by the age of 19 and 9GS titles total. It seems to be an interesting blog. There is a similar one in French, life on the tour, by foot soldiers. It is sometimes hard to read. I feel so sad for those who didn’t fulfil their dreams. But defeat is the norm in life. I am not sure that Nole is going to add any tournament before Wimbledon, besides, he plays DC this year and they are very serious about it. Tipsa is trying to play himself in form before QF match, by his own admission he was gutted for not being able to help Nole due to injury in the final two years ago. Troicki is fired up too and they are all playing more doubles this year to try to improve their chances in doubles matches and to find best pair for it. indeed, it is mat4. but it’s great to read those more “firsthand” accounts sometimes. If a player meets one condition, he can skip one mandatory masters 1000 w/o penalty. If a player meets 2 conditions, he can skip 2 mandatory masters. If a player meets the 3 conditions, he has no obligations whatsoever, he can skip as many masters as he wants. Nole will not get a 0-pointer. He will get 0 points, but only because he plays very few tournaments, he never fulfills the 18 touenments he could count…But in theory, he could count the points earned in another tournament instead of Madrid. I think that’s what Roger will do: he will count Istanbul instead of Miami. thanks yolita! it’s amazing how clear it is when facts are brought into the picture. Thanks for detailed explanation to Sienna, she is a long standing Nole fan on TX. haha travis. looks like he will skip Madrid from now on..
o right if all thee are met you can skip at will. So fed can do what he wants. Expected!. An opportunity for Rafa to win a fifht Madrid master 1000. Thanks WogBoy, forgot about DC. But I think with the extra week, he will probably play a tune up. as both are 500 now. Will see, hope he plays. leo, that seems misinformed. hasn’t nadal taken time off for injury at other times? like the end of 2012 through to the beginning of 2013 with his knees? or almost the whole season post-wimbledon last year, which started due to a wrist issue? i realize there were illnesses in those stretches too but there were definitely breaks for injuries beyond 2009. he also had some special shots in his back last year, stem cell maybe? can’t remember precisely. Didn’t Rafa skip USOpen last year because of a shoulder injury. Rafa also skipped AO 2005 or 2006 due to foot injury. And to say that Novak is the reason Rafa don’t have 18-20 slams is also absurd. Djokovic has 3 wins over rafa at slams and the last one came at 2012 AO. Since then, he is 0-4 against rafa, one of which was on USO. Do the people who make that argument not realize that Roger would also have more slams if not for Novak? Fedal were 9 years younger in 2006!!! ^^ I don’t need to answer that surely!!! oh, sorry about that leo. i must’ve been too tired to register the sarcasm. ha ha. personally i don’t think it left both hobbled, though they did have some epic battles throughout that year’s clay season. i do think, however, that the madrid loss caused even more mental doubt in novak, all those match points lost, etc. i remember in his post-match interview he said he needs 2 racquets to beat rafa on clay or something. perhaps he just wants more time to train/rest? Roger with the toughest draw in Madrid. Could see Kyrgios, Isner, Berdych, Rafa before the finals. I’m seeing this “under the table” BS again. Lol. Why would Madrid or any other tournament resort to under hand ploys to get joker or any other player to support their tournament. If they don’t wanna play they won’t play. There is plenty of star attraction without having to fuss over one player who in this case will not be missed in Madrid. A lot of ifs in that article which don’t count for much. However, the writer has a point about 2011, the single most impressive year of any player in history in my opinion bar none. Travisit Bickle is a gem. Made me laugh aloud with his last paragraph too. Glad if Nole skips Madrid indefinitely. Skeezer = Jeremy Eckstein is an excellent writer. He understands that everyone wants Djokovic to have his winning or losing the French Open as the most important, defining point of the year. And how it is a calculated risk – Rafa may regroup in Nole’s absence. No net touch done, a French Open under his belt, it would have been interesting to have Djokovic and his team contemplate with 4 straight Masters wins and the WTF done, the possibility of going for something more difficult to achieve than a Grand Slam. 2 clays, Toronto, Cincinnati where he hadn’t won yet, and Shanghai were left. Still could happen in another year. If he gets the white whale, that is. Novak “only” managed five of nine in the most impressive single year ever and Roger just four in both 2005-06, his most dominant period. For that matter, no one has ever completed a career Masters sweep, let alone in a single year. Novak is missing just whereas Nadal and Roger are both two shy. The fallacy of those saying that both Rafa and Nole have had tougher matches, including with each other like the 2012 AO, therefore neither could ever get injured in a shorter match? Obvious. And Nole and Uncle Toni have noted that Madrid semi shaped the rest of 2009 for both, and into 2010 for Nole. Djokovic had confidence issues emerge from having victory in is grasp, 3 match points when he was playing unbelievable, but still losing. Uncle Toni said the match hobbled Rafa, sapped his nergy. Making Feds finals win on clay against him there relatively easy. Toni said it improved at Rome, but his knees worsened in the French Open. And all credit to Soderling, but weather, family troubles, and agony in the knees played a part. Wimbledon missed, USO hindered, and forced to retire with knee injury from the AO in 2010. Roger’s 2009 resurgence stemmed from Madrid. Never had to face Rafa in his 3 Slam wins after that. elina i agree with you about the calendar masters sweep being entirely implausible, and for all intents and purposes, undesirable too, as it could really tire out a player and hinder his/her performance in the slams, the most coveted titles. i would, however, love to see novak win cincy one of these years. Also keeping my fingers crossed that Nole wins Cincinnati one of these years and…something else I won’t mention right now. Novak’s withdrawal is a great blow to the tournament. I am not sure about the reason for his withdrawal ? May be, he wants to keep himself fresh before the more crucial Rolland Garros. The prospect of a Roger Vs Rafa semi final is tantalizing. Wish that fructifies in the larger interest of the audience who wish to see these two great men play each other yet again.